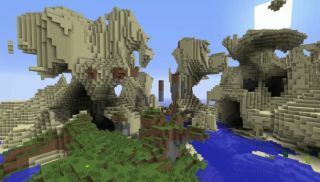 Minecraft 1.8 will soon be released, and with it comes an overhaul to world generation. As of the upcoming patch—due sometime next month—a new option will let players tweak world generation settings, allowing for even wilder terrain types. A new video teases the update, and the number of values that can be adjusted. As someone who can't tell his Main Noise Scale from his Depth Noise Exponent, I'll be taking the less refined approach: crank it all to the max. "There are 16 sliders which can be used to affect various aspects of Minecraft's terrain generator," explain Mojang, "but you can also type in values directly. You also have complete control over things like the sea level and what structures you want to generate." In addition to the tweakable sliders, a number of presets will be made available. In the video, we get brief looks at Crazy Mountain Place, Crazy Island Place and Crazy Water Place. The list of options shown suggest that Crazy Lava Place and Crazy Cave Place will also feature. For a full list of Minecraft 1.8's planned features, head over to the version update page of the Minecraft Wiki.